This month I didn’t have too many new product favourites, but I will share with you the wonderful things I did love. Aromaforce Lavender Essential Oils – In the fall I bought an essential oil diffuser because I had read that lavender can help with insomnia. 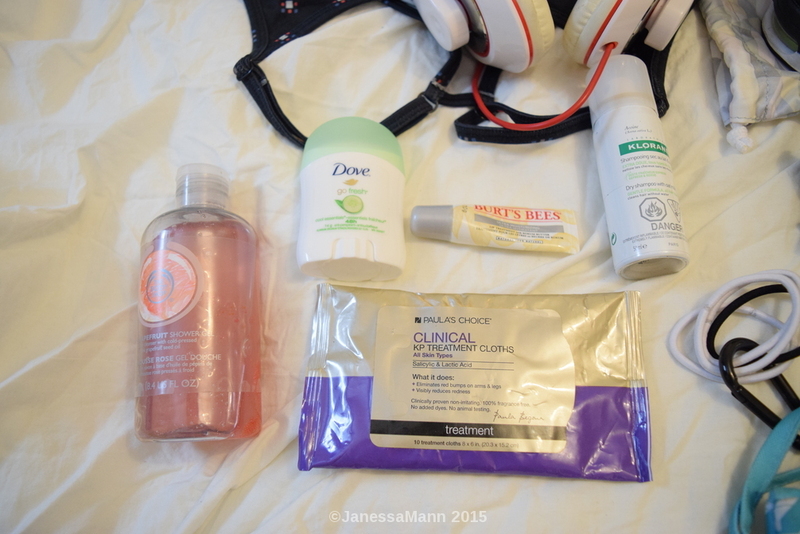 Neutrogena Body Clear Body Wash pink grapefruit – So necessary when you work out a lot, super helpful for bacne. The biggest issue with working out. Marc Anthony Nourishing Argan Oil of Morocco 3 day smooth – I don’t do much to my hair, but when I do blow-dry it I like to use a smoothing cream so it looks nice. This argan oil cream makes my hair super smooth and beautiful when I apply it before blow-drying. However, it doesn’t do much if you just put it in and then let it airdry. Thursday Plantation Tea Tree Medicated Gel for Acne – Tiny, expensive tube, but cleared up the bacne I had really quickly in time for the wedding I went to recently. I’ll probably keep it on hand for when I have a bad breakout, but for cost effectiveness I’ll just use tea tree oil every day. Squish Strawberry Rhubarb – I discovered Squish in the fall, and love their candy. They’re based in Montreal and are gluten-free, use real fruit extracts, no artificial colours, no-GMOs, and are fat-free. These are perfect to make me feel like I have a strawberry rhubarb pie with me right now. Lush Aromaco patchouli deodorant – I’ve used this deodorant for years. I love the smell of patchouli, and unless I’m working out and going somewhere afterward, this is strong enough to block out any B.O. I keep mine in a small plastic container to keep in the moisture, and one $5 block can last me for a whole year. Check out what’s in our herb garden! On Saturday, Nic and I got to check out an Olympic Lifting class, run by his friend Winston, at CrossFitYKV. It was a lot of fun learning snatches and cleans, and I look forward to incorporating some more of those movements into my powerlifting routine. At the end of the main workout, Winston said, “let’s do accessory work now.” For Olympic lifters, their accessory work is squats and deadlifts. That’s my main as a powerlifter. I squatted less than I normally would, but Nic and I were definitely sore on Sunday. I’d definitely recommend that gym, it’s BEAUTIFUL. 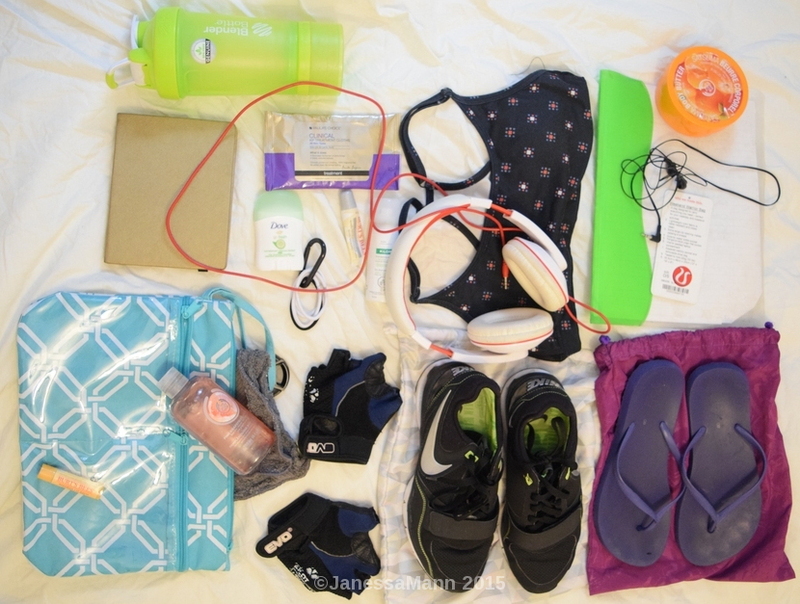 I recently got into watching fit womens’ “what’s in my gym bag” videos on YouTube, so I figured I’d make a blog post about it. This Christmas my parents got me this beautiful bag! I had a leather yoga bag from Blogilates before, but it was really worn through and since it’s leather, it’s pretty heavy. 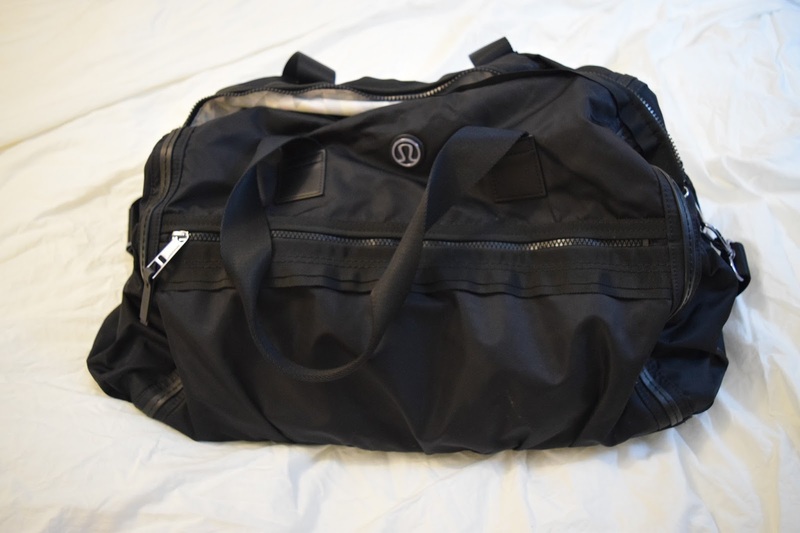 This bag is a lot lighter, has more pockets, and is easier to clean. 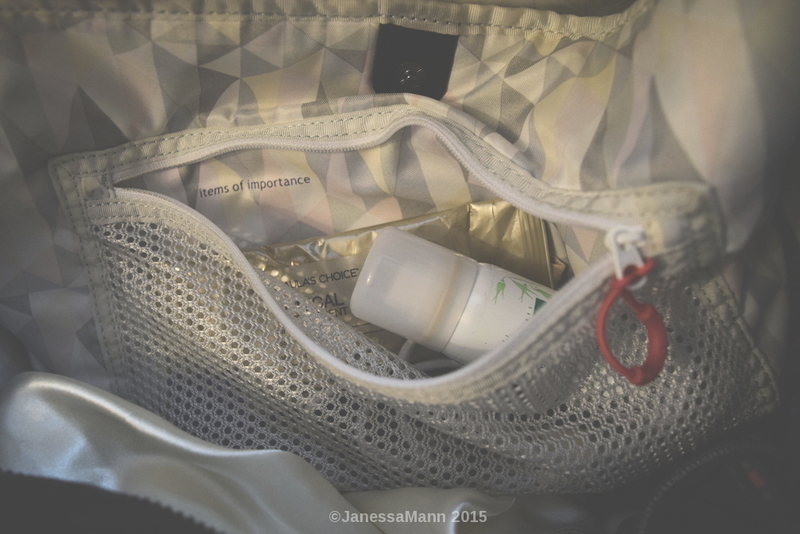 I keep my toiletries in this zippered pocket so they’re faster to find. Now that my closest GoodLife is about 10 minutes away by public transit (in Ottawa it was 2 minutes in the car) I’ve taken to showering there. My body wash is a mix of the Body Shop’s grapefruit shower gel and Neutrogena’s Body Clear Body Wash in Pink Grapefruit. I keep a mini deoderant in my bag in case I’m going out afterward, this is Dove’s cool cucumber. Any moisturizing lipbalm, this is Burt’s Bees “lip treatment with kokum butter”. I always keep makeup wipes in case I don’t have time for a shower. I got this sample of Paula’s Choice “Clinical KP Treatment Cloths,” they have salicylic acid so it helps with making sure you don’t get a breakout. My dry shampoo is a sample size of Klorane’s oat milk dryt shampoo. Waterbottle/shaker: ProStak from Bed Bath & Beyond, love having water and then the protein powder in the bottom. My Kobo Aura for reading on cardio machines, otherwise I’m real bored. My headphones are from Sound Logic, I got them for $15 on a Groupon deal, apparently they’re worth $80? Whatever. Someday I’ll get a new pair, these are too small for my ears, especially if I wear glasses. 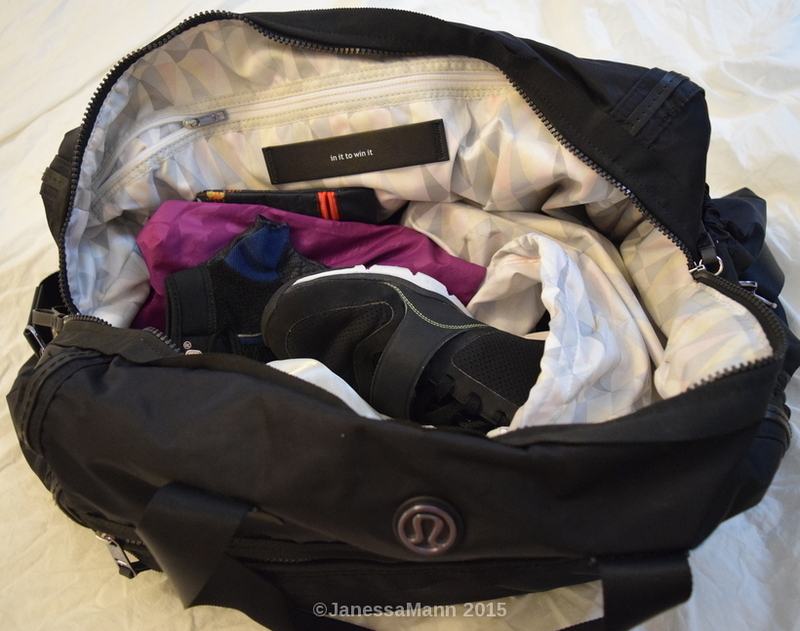 Always keep an extra sports bra and pair of underwear in your bag, in case you forget to pack one. I keep a folder with my workout tracker sheets so I can see when I have back flareups, if I’ve gone up in reps or weight etc. When I know I’m going to shower at the gym, I bring my bathing suit bag. I bring a washcloth instead of a loofah, and put the body wash in the bag in case of leaks. Gotta have my douchey bike gloves to stop myself from getting aggressive callouses from weightlifting. My cross-training shoes are the Nike Trainer Ones. I love them. Also gotta have flip flops for the shower.